Boy jumping right back in has been tougher than I thought it would be! I opened my computer at around 8:30 yesterday morning with a cup of coffee and Father of the Bride on the TV (thank you TBS) and had a whole lotta nada came out of my fingers. But I'm pushing through and here with some insight into how I spent my last year. As I mentioned in my post about last July being the month of change, I started a brand new job in Florida. 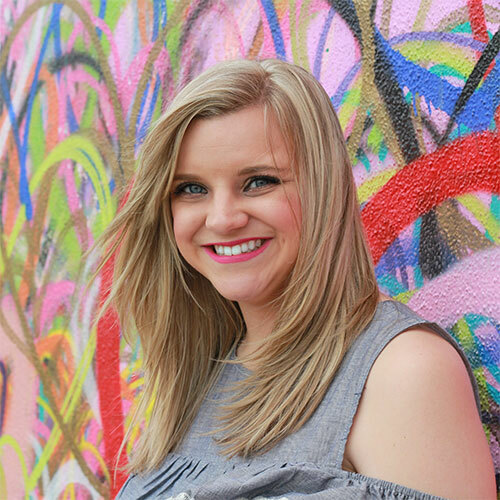 I left Disney (well sort of) and jumped into my teaching career. Now this is by no means everything that went on this year. Because as I'm sure most of you know A LOT happens within the course of a whole school year. I taught both US and World History and had about 125 students spread between 6 classes. My school year officially started in August. I had about 1 week to get everything ready for the students. Now since this was my first official year teaching, I literally had NOTHING. Lucky for me though, I had 3 fellow teachers who I leaned on and who let me lean on them pretty much the entire year. I seriously have no idea what I would have done without Stacey, Kim and Todd. Kim and Todd have each been teaching for 20+ years so they had a wealth of knowledge. Kim was kind enough to let me raid her closet for some posters and stuff and then I went out and purchased a few calendars and used the pictures of those calendars to post around the room. Advice to first year teachers: BE ORGANIZED!!! Starting from day 1. They more organized you are the easier your life (in the classroom at least) will be. Here's a little peak into my classroom. This was one of the first pictures. As the year progressed more was added to the walls! 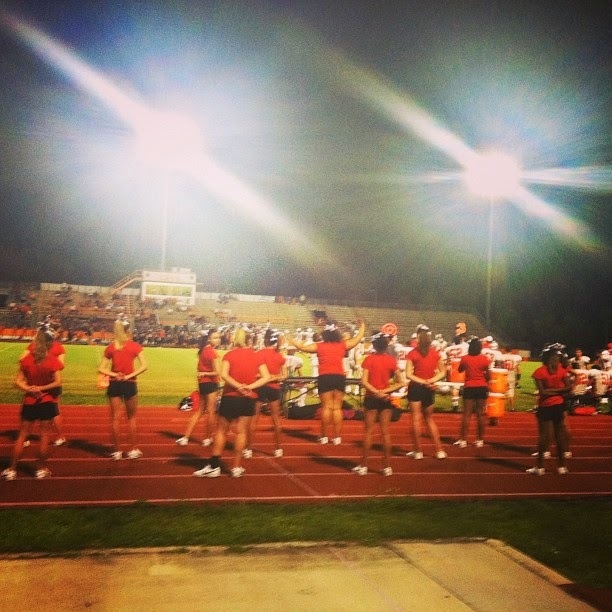 Here are my JV cheerleaders at their very first football game! Probably one of the best weeks at school was Homecoming week! Now I will say that Texas schools have a major one up on Florida schools when it comes to Homecoming. But we all had a blast just the same. As you can see from the picture below. We had spirit week and each day was a different theme. What you see here is Super Hero day! 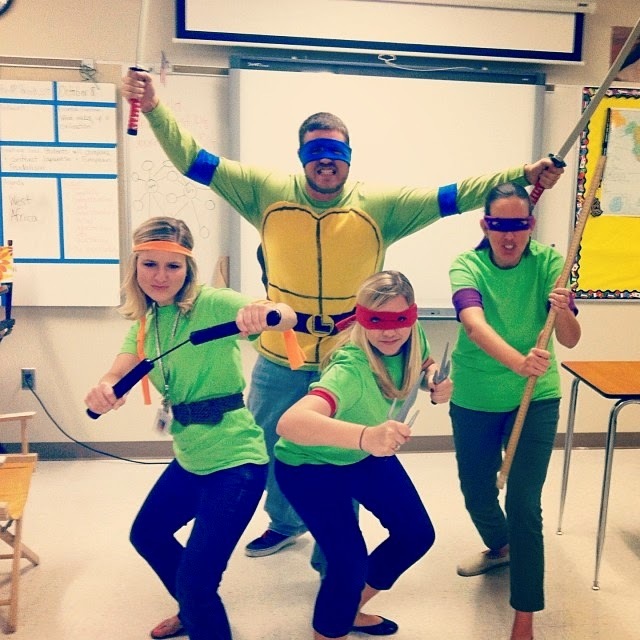 So along with 3 other teachers, I dressed up as a Ninja Turtle! We had several spirit weeks throughout the school year but this was the only week that I got really into. One thing my school was amazing at, was showing appreciation for its teachers! 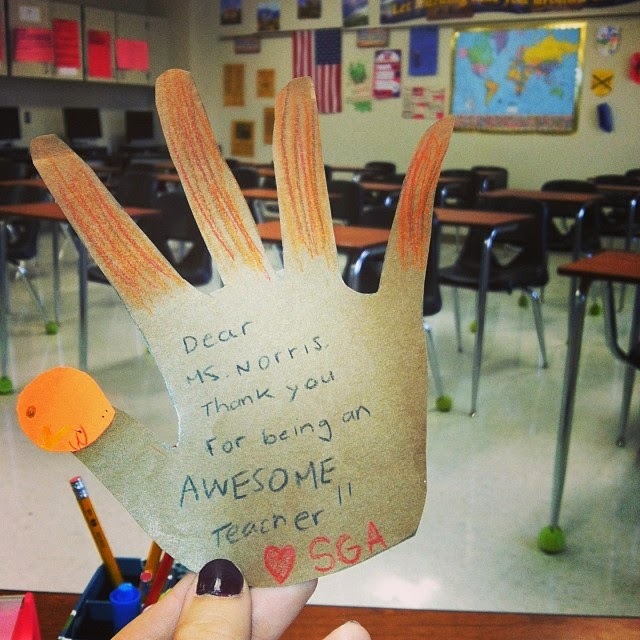 For every holiday we were given a little something by our school SGA (Student Government Association). I made sure to keep each of them as a little memento! Probably one of the more nerve wrecking things from the year was teacher evaluation time. Basically that means that my teaching skills, classroom management skills, etc was evaluated by my assessing administrator. And guess who my assessing administrator happened to be? MY PRINCIPAL! Talk about pressure! He came into my classroom about 4 times each semester and I was graded on how I did. At the end of each observation I would get a little e-mail showing me my evaluation. I have to give myself a little pat on the back because I did pretty good!! 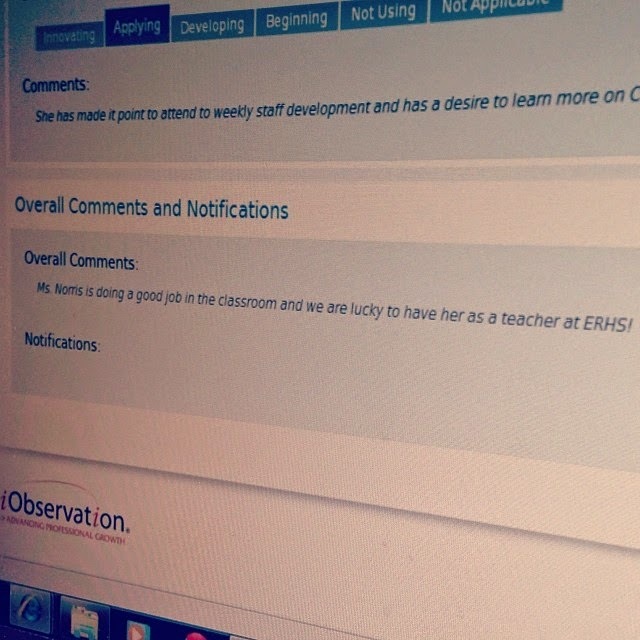 By the end of the year I was evaluated as a Highly Effective teacher! Not bad for my first year, huh! Obviously my favorite part of teaching was my students! I had such a diverse group of kids and by the end of the year I had a special place in my heart for each of them! Well, most of them anyway, not the kid who told me to shut up. Again, I'll save that for a later post. But seriously, being with the kids everyday was so rewarding. I think my favorite moments were the AH-HA moments. The moments I knew I had taught them something and that they would never forget that something. Now don't get me wrong, I had my frustrated beyond belief moments. After yelling for the hundredth time at them for not doing their homework (which was often), for example. But the pros definitely outweighed the cons! Especially when you get Valentine's Day cards like this one! Other favorite moments were the moments with my fellow teachers! 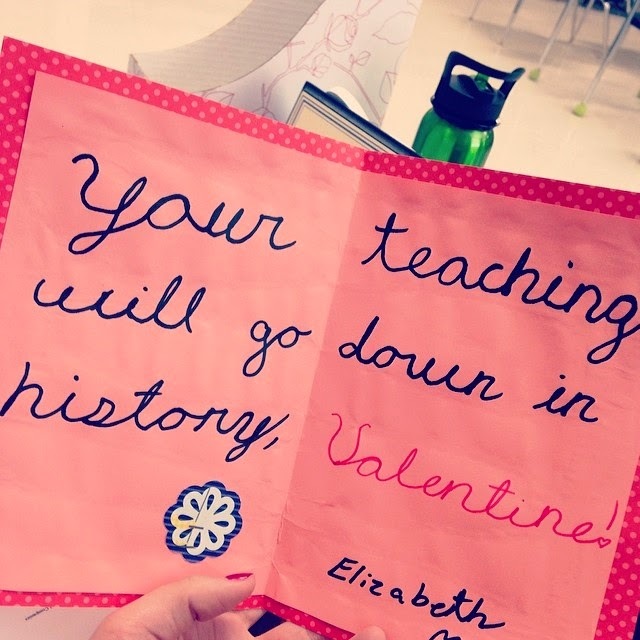 Teaching is definitely a profession where you connect and bond with your co-workers. Because we are all going through the exact same frustrations and triumphs. Like I've already said, I cannot imagine getting through this year without what we fondly called out "Work Family". I can't tell you how many times I went next door or across the hall to vent about a lesson, a student, another teacher, my roommates at home......just about anything! 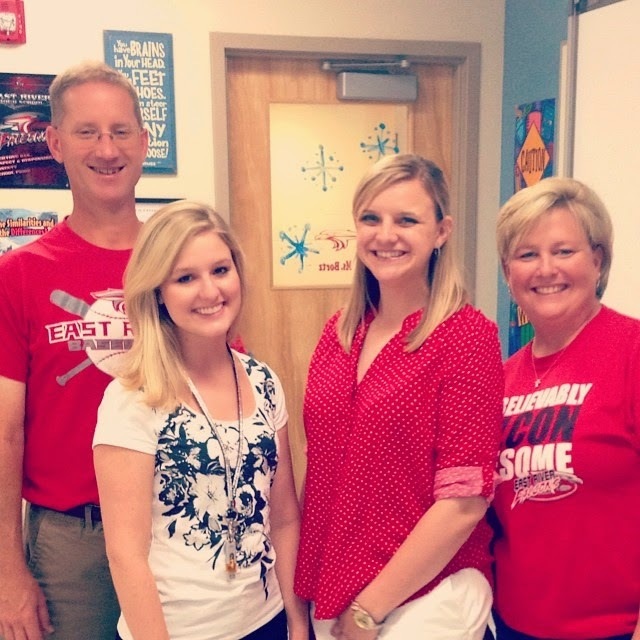 I really hope that I connect with my fellow teachers at my next school as well as I did with the teachers at ERHS. Plus, you get funny notes like this one. From one World History teacher to another. Now, I can't write about my first year of teaching without talking about some of the.....shall we say more interesting moments with some of the students. Now I'm using the word "interesting" but really I mean dumb. Because lets be honest, high school kids can be down right dumb sometimes. And here are some perfect examples. This is a picture from my best work friend/work sister's, Biology class. 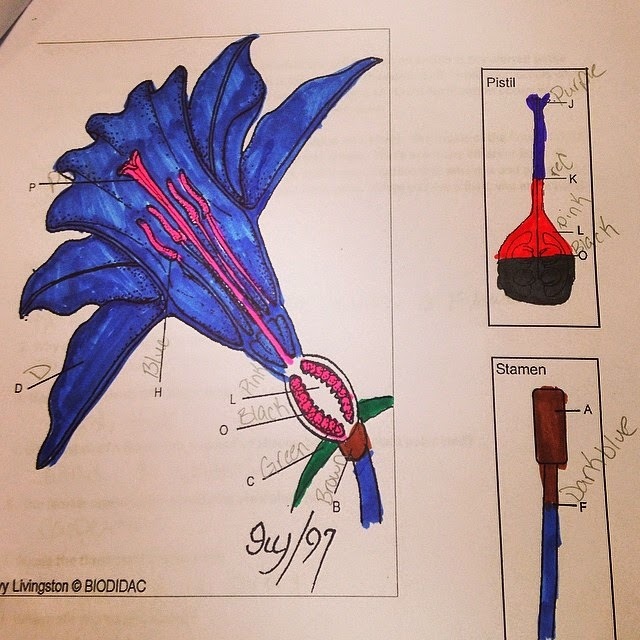 The assignment was to LABEL and COLOR the parts of the flower. And this students didn't exactly understand the directions. When I saw this...I DIED and obviously immediately posted it to Instagram. You may have to click on the picture to see the exact words, but once you do....you too will die laughing. Next we have one of the most classic and infuriating things that has been happening in school since school was invented! I assigned a research paper to my US History students. They had 2 whole months to complete it. Along comes the day that rough drafts are due and one students turns in a very thick set of papers. The paper was supposed to be 3-5 pages and this kids turns in 8 PAGES!! Yeah...red flag numero uno. Then as I start to read the first few lines red flag numero dos pops up because the word "tinkering" is used in the first line. No high school student would EVER use the word tinkering.....ever! SO I did what any normal teacher would do and that is type the whole first line into Google. Lo and behold, the kids WHOLE ENTIRE paper pops up on a site on the internet. Heads up.....teachers are NOT stupid!!! If you blatantly plagiarize, you WILL get caught! And you WILL get a zero and I WILL make you feel like you're the size of an ant. 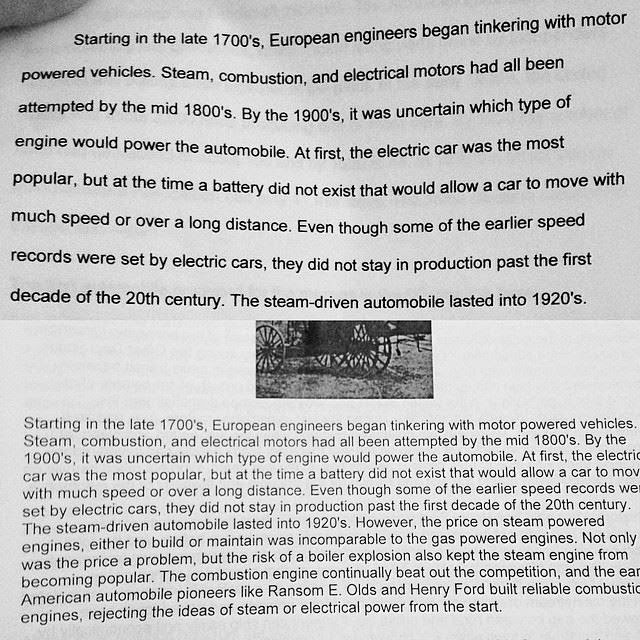 I had 2 other students plagiarize on this assignment. 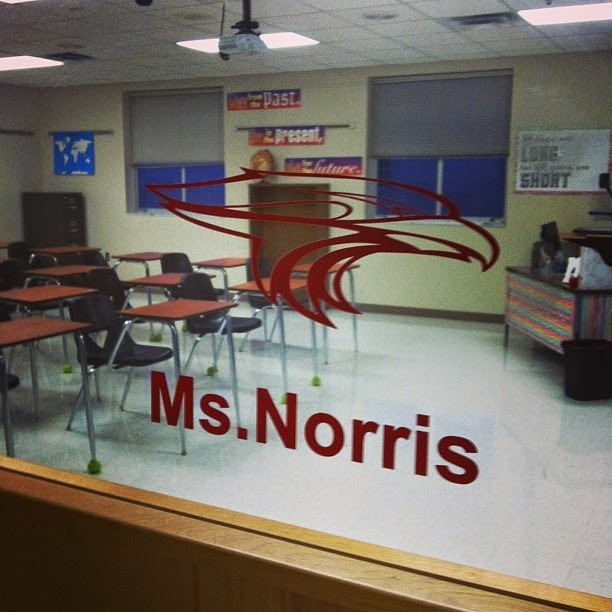 I was NOT happy and they felt the wrath of Ms. Norris! Let me tell you. Overall, I had a pretty fantastic first year at ERHS. I wouldn't have wanted my first year to have gone any other way. I laughed a lot, I cried a lot, I called home A LOT (both my parents are teachers and their advice was asked for at least, I vented to my roommates and fellow teachers a lot, and I loved every single minute of it. Here is my "Work Family". The group of teachers I really bonded with throughout the year. I will never forget the people and all they taught me my first year. That includes my fellow teachers and especially my students. Teaching isn't for everyone. It's hard work, long hours, and can be exhausting. But I wouldn't have it any other way. 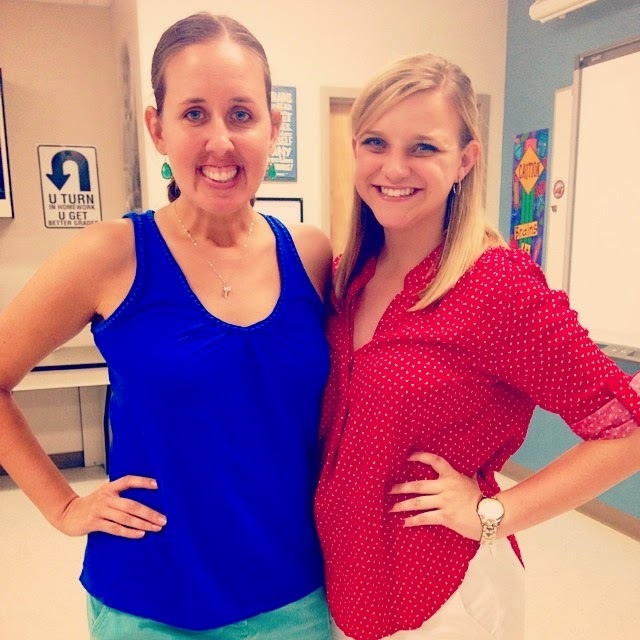 Having survived my first year has made me realize that I made the right decision to leave Disney and start teaching. Bring it on Year 2! Lets see if you can top Year 1!